(AP) Youths torched cars, set garbage bins alight and threw stones at police in a fifth night of rioting in a Paris suburb, and set two primary school classrooms on fire as rioting spread to two other suburban towns, police and an official said Tuesday. The press is only alluding to this distantly, but it seems that the rioters are predominantly Muslim immigrants from Northern Africa... which is why comparing this to the Palestinian intifada ("uprising") makes sense. [Interior Minister Nicolas] Sarkozy recently referred to troublemakers in the suburbs as "scum" or "riffraff" and in the past vowed to "clean out" the suburbs. To begin with, when did France add an Equal Opportunities Minister?? Do they really need one so desperately? And Monsieur Azouz Begag tells us a lot about what that post represents. "Imprecise, warlike statements"? (What is imprecise about "scum" and "riffraff"? That sounds quite specific to me.) And "warlike" -- well, when teenage hooligans riot for several straight days, destroying property, setting police cars on fire, and resisting arrest, would you prefer to sit with them over herbal tea to discuss differences? Personally, I'd say that "fighting discrimination" is liable to be a long-term project, M. Minister. In the meantime, you'll need to do something about the skyrocketing costs of car insurance over there. I don't know if this is the start of something big, as Prof. Reynolds suggests. But let me remind you that the trouble has been brewing in Europe for over a decade now, with Muslim families moving in, enjoying European social services, and failing to integrate themselves into European society. As the French government wonders whether or not to ban headscarves in public schools, synagogue torchings -- and Muslim honor killings -- are increasing. And let me remind you that nothing is permanent... as the Europeans, of all people, should know. Does anybody remember the city of Constantinople, which dated back to the early period of the Christian Era? It was a capital city for over a thousand years, first of the Eastern Roman Empire, then of the Byzantine Empire, until it was sacked and burned by the Turks in 1453. It has been a Turkish city, now called Istanbul, ever since. Do you think France will never become a predominantly Muslim country? Think again. It could happen in your lifetime. UPDATE: Roger L. Simon is one of many who are covering this. Meryl Yourish points out that the "canary in the coal mine" phenomenon is alive and well -- first Muslim youths attacked French Jews, which the French authorities ignored as long as they could. Had they done something about it then, they might have avoided this. Nov. 3 (Bloomberg) -- Gangs of youths destroyed 177 cars and fired four shots at police in 20 Paris suburbs in a seventh night of violence that presents a growing challenge for the government of Prime Minister Dominique de Villepin. In Aulnay-sous-Bois, northeast of Paris, youths tried to set a police station on fire, a city hall spokesman said. They burned a Renault SA showroom, after torching a car rental business the night before, he said. Garbage containers were set on fire and bus shelters were destroyed, he said. Bullets fired at police in three locations in the Seine-Saint-Denis department didn't cause injuries, its prefect Jean-Francois Cordet told reporters. The violence reflects tensions in French ghettos marked by youth unemployment of more than 20 percent, poverty and large immigrant Muslim communities in the majority Catholic nation. 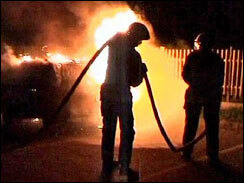 The riots also show the difficulties faced by many European nations in integrating immigrants. Police plan to deploy an extra 1,300 officers tonight in Seine-Saint-Denis for a possible eighth night of violence after nine people, including four policemen and two firefighters, were hurt last night, Cordet, the chief government official in the department, said. 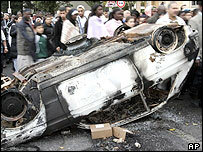 More than 28,000 cars and 17,500 trash bins have been torched in France so far this year, Le Monde reported, citing the Renseignements Generaux, the French police intelligence service. Yikes. That's a lot of trash... and a lot of people using public transportation this winter. UPDATE III: Via the Instapundit, lots more, including an interesting contrary point of view. UPDATE IV: An unforgettable perspective on France, its immigrant problem, and its bleak future, in a 2002 article by Theodore Dalrymple. UPDATE V: Mark Steyn was his usual self on yesterday's Hugh Hewitt show. Transcript available here. Crucial points: he claims that we're seeing the beginnings of what he calls the 'Eurabian civil war'... and that, in this and other things, America should take care to avoid going where Europe is now.